Today’s Christians are increasingly dissatisfied with their church “experience” and with the relevance of the church in the world. Many see the Bible as an ancient book, written by men, and with little application to today’s culture with the exception of some commonly known passages pertaining to the Golden Rule or “Do not judge....”. We see the alarming statistics of our young people walking away from the faith in droves when they leave to attend college. For those who do continue in their spiritual journey, countless young people in today’s pop culture are in search of something spiritually and experientially “real.” Sadly, many are flocking to cults, charismatic churches, prayer houses (such as International House of Prayer), or a new kind of Christianity, such as the “Emergent Church.” Others who stay with doctrinally faithful churches are attracted to what they feel is the best of what contemporary evangelicalism has to offer in order to meet their felt needs, including a menu of programs, concert-quality contemporary music, drama, and messages that “tickle the ears” and have been diluted of the heart of the gospel. It is our fear that Christianity is becoming increasingly “cultural,” increasingly shallow, and all about the experience rather than true worship and obedience to the Word of God. The scriptures warn us of this in 2 Timothy 4:3, “For the time will come when they will not endure sound doctrine; but wanting to have their ears tickled, they will accumulate for themselves teachers in accordance to their own desires...”. It is our belief that today’s contemporary church is in need of a modern reformation. Given the development of our postmodern and post-Christian culture, it should be no surprise that many today do not have a robust understanding of scripture, theology, church history, and from where modern evangelicalism has emerged and developed. While the Protestant denominations can trace their lineage back to the Reformation, most Christians in the Bible-belt do not realize this history and certainly would not call themselves “Reformed”. Some would even recoil at that label, even though some of history’s greatest evangelists and preachers were Reformed, including Baptist preacher Charles Spurgeon. Nonetheless, it is a fact that evangelical Christianity is squarely rooted in the soil of the sixteenth-century Protestant Reformation. 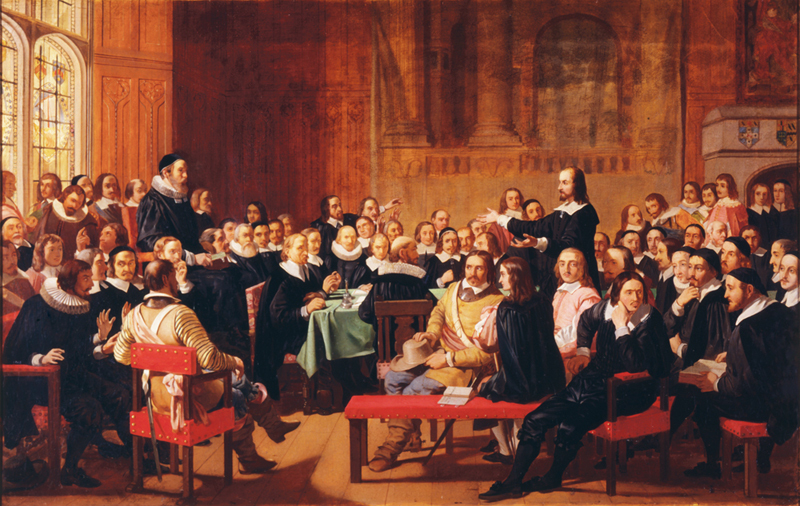 Just as the Reformers protested the corrupt teaching of the Roman Catholic Church, so today our contemporary evangelicalism is in need of a modern reformation to bring it back to its rich, scriptural and faithful history; a reformation that will take us once again to a deep appreciation and understanding of Biblical theology and the God-honoring worship and practice of the Reformers. It is our desire and prayer that our humble congregation can continue the reformation from our culture’s modern man-centered worship and spirituality to a God-centered conformity to the Word of God. Our desire is not to exalt man but to glorify God and enjoy Him forever. We continue to pray for modern reformation in our church and in our community. There are numerous resources readily available on the internet which explain the depths of the Reformed Faith exceedingly well. Below you will find some of those links. In providing these links, we endeavor to share with you our heart, our theological understanding, and our zealous view of God’s Word. While some of the articles are written by other conservative, Bible-believing reformed Presbyterian denominations (such as the Orthodox Presbyterian Church), we find that we are of one mind with our brothers and sisters in Christ in how we view and understand the scriptures, our faith, our theology, and our practice. These resources effectively communicate the majesty of the Reformed Faith and worship.